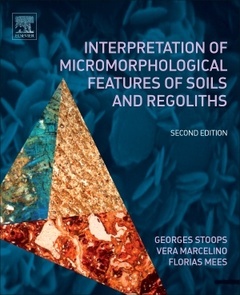 Interpretation of Micromorphological Features of Soils and Regoliths, Second Edition, provides researchers and students with a global tool for interpretation of micromorphological features of regoliths and soils. After an introduction and general overview, micromorphological aspects of regoliths (e.g., saprolites, unconsolidated sediments and transported materials) are highlighted, followed by a systematic and coherent discussion of the micromorphological expression of various pedogenic processes, covering diagnostic horizons, materials and processes. The book is written by a team of well-known global experts in the field who use a single set of concepts and terminology, making it a valuable interdisciplinary reference. The following topics are also treated: freeze-thaw features, redoximorphic features, calcareous and gypsiferous formations, textural features, spodic and oxic horizons, andic and volcanic materials, organic and surface horizons, laterites, surface crusts, salts, biogenic and inorganic siliceous materials, authigenic silicates, phosphates, thionic and derived materials, and features related to faunal activity. The last chapters address the impact of anthropic activities with regard to archaeology and paleopedology. Georges Stoops contributed substantially to the understanding of the genesis of arid and tropical soils, and the application of mineralogical techniques. He was one of the first to explore, in 1968, the possibilities of SEM techniques in micromorphology. His outstanding activity at an international level, including organizing training courses and workshops, contributed considerably to the development of soil micromorphology, while his enthusiastic teaching in Ghent and overseas promoted the use of soil micromorphology worldwide. His achievements have been honoured by the Dokuchaev award of the All Union of Soviet Soil Science Society of the Academy of Sciences (1985) and in the Kubiëna Medal of the International Soil Science Society (1992). Dr. Marcelino edited the previous edition of the volume, alongside Professor Stoops and Dr. Mees. He has numerous years of experience researching in soil micromorphology. Dr. Mees edited the previous edition of the volume, alongside Professor Stoops and Dr. Marcelino. He has numerous years of experience researching in sediment petrology, soil mineralogy and micromorphology.